‘Syria is Life’ Exhibition depicts resistance against terrorism. Damage within the Old City of Aleppo. Photo credit Syrian Free Press. Aleppo Archaeology shared recent footage showing the damage to the Old City of Aleppo, available here. 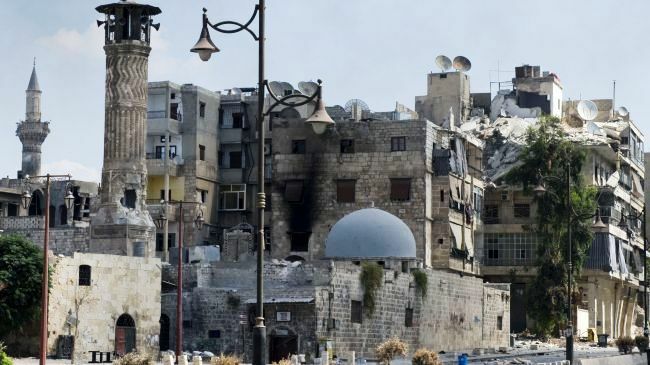 The DGAM has prepared a damage assessment of several areas of Aleppo, including Abbais Mosque, Al-Akakini Mosque and Al-Tawbeh Mosque, here; Dar Janpolad_Beit Junblatt here; and Owch Khan, Souk Al-Nahassein and Zaki Mosque here. Aleppo Archaeology have also placed several appeals on their page, one about books that will be lost (here), and one regarding a site in imminent danger of collapse (here). If you can, please do reply on the Aleppo Archaeology page. The Association for the Protection of Syrian Archaeology have shared photos of damage to the World Heritage Site Palmyra here. In breaking news, Syrian government forces and their Russian backers have completely recaptured the ancient city of Palmyra from so-called Islamic State (IS) militants, the two allies say, according to the BBC. The Authority of Tourism and Protecting Antiquities in Al Jazira Canton has produced a general report about the archaeological sites during the year of 2016. The Department of Antiquities in the city of Bosra, a World Heritage Site, have reported heavy damage to the 2nd century AD Trajan’s Palace, and to residential areas. Read the damage assessment and see photos of the damage here. Idlib Antiquities Centre are working to document damage from looting, conflict and also construction to sites, at some of the World Heritage Ancient Villages of Northern Syria, and the nominated Tell Mardikh (Ebla). See some photos here, here, here and here. Photos of the extensive damage at Tentative World Heritage Site Apamea are available here. Antiquities sales supporting ISIS fails the test of robustness and academic concern over an inappropriate response in relation to protecting cultural heritage. Read more on this opinion piece by Ivan Macquisten for Homeland Security Today here. Idlib Antiquities Centre are working to document intangible heritage practices in Syria. See some photos here, here and here. On 28 / 2/ 2017, the Authority Of Tourism and Protection Of Antiquities in Al Jazira Canton (Democratic Self-Management) opened a gallery in Al Hasaka city , titled “Cry stone”. – indicating that the systematic damage (illegal excavations and abuses as example ) in some of sites in Al Jazira Canton aims to remove the scientific truths. The exhibition runs 28/2/2017 until 1/3/2017. See photos of the exhibition here. About 20 volunteers sorted through the debris in Khan Al Gumruk, Aleppo, one of the souk’s great medieval inns, piling up the stones from a fallen archway that can be used in its restoration. Officials were working on a plan to save what they can. The Aga Khan Development Network’s cultural arm, which was behind a multi-million dollar restoration and urban development project around the Citadel and nearby souks a decade ago, said it was also looking at possible rehabilitation of the area. Read more in The Jordan Times. Idlib Antiquities Centre are conducting training in conservation and documenting and packaging: see photos here. They have also recently signed an MOU with Lawyers for Justice regarding coordination to work to protect archaeological sites in the area (here). They are also intending to launch a guild of archaeologists to identify problems and develop solutions and working mechanisms. Register for the union by clicking the link here. Arch International featured the efforts of Muslims, such as Aahed Sulayman, who worked to save the Jobar Synagogue in Damascus. Although it was destroyed the local community were able to save many of its artefacts. See the photo and text, here. Around 13 artists from several generations are taking part in an art exhibition opened Monday in Abo Remmaneh Cultural center in Damascus under the banner “Syria is Life”. The exhibition includes 20 paintings and 3 sculptures depicting resistance against terrorism, according to the Syrian Arab News Agency (SANA). “The exhibition reflects Syrian people’s ability and will to continue living despite pains,” Qaddour added. Read more here. The proceedings of the colloquium on post-trauma reconstruction, which was held at the ICOMOS headquarters in Charenton-le-Pont on 4 March 2016, are now available online. The symposium, which hosted about 75 participants, took place in two parts: six keynote speakers gave short presentations in the morning, before thematic discussions were held in small groups during the afternoon. The proceedings of the day are presented in two volumes. They can be downloaded here. Created and hosted by the Getty Research Institute. “In this 21st century, war in Syria has irrevocably changed the ancient caravan city of Palmyra, famed as a meeting place of civilizations since its apogee in the mid-2nd to 3rd century CE. The Romans and Parthians knew Palmyra as a wealthy oasis metropolis, a center of culture and trade on the edge of their empires. Stretching some three kilometers across the Tadmurean desert, the ruins of Palmyra, like all ruins, stand as bearers of meaning marking their place in history. For centuries, traveling artists and explorers have documented the site in former states of preservation. Created as a tribute to Palmyra, this online exhibition captures the site as it was photographed for the first time by Louis Vignes in 1864 and illustrated in the 18th century by the architect Louis-François Cassas. Their works contribute to Palmyra’s legacy, one that goes far beyond the stones of its once great buildings.” See the artistry here. The Penn Cultural Heritage Centre and others have put the draft of an ethics charter for Near Eastern Archaeology and Assyriology on their website. This document, based on official statements and an exchange of views among members of the community of Assyriologists, Near Eastern Archaeologists and specialists of the ancient worlds is intended as a starting point to assist colleagues in often difficult or uncertain conditions, and for general guidance. For more information see here. A new resource-rich website exploring the prosecution of crimes against cultural heritage during conflict has just been launched. Targeting History and Memory comprehensively documents for the first time how the International Criminal Tribunal for the former Yugoslavia (ICTY) investigated, reconstructed and prosecuted the intentional destruction of cultural, historical and religious property committed during the Wars of Yugoslav Succession of the 1990s. Targeting History and Memory was produced by SENSE Centre for Transitional Justice, which in its previous incarnation as SENSE News Agency has offered comprehensive and balanced coverage of the work of the ICTY since 1998. Read more about this by ARCA Blog here. A new study set out to re-create the impact of small arms fire on stone columns and structures that have endured thousands of years of sun, wind and rain. When struck by small arms fire, it found, these ancient artifacts show little sign of outward damage. But the impact of a .22-caliber bullet creates a network of tiny capillaries that spreads beneath the stony surface of, say, a column or its capital. As water or environmental toxins seep into those newly opened vessels, the result is likely to be the rapid degradation of irreplaceable antiquities. The new study was published this week in the journal Royal Society Open Science. Read the full study here and the LA Times overview of it. Arab League Secretary General Ahmad Abul-Gheir stated heritage protection was a priority. At a ceremony held at the Arab League in Cairo on Sunday, to mark Arab Heritage Day, he called for people to join together to preserve the heritage and civilization of the Arab nation, according to Kuwait News Agency. The Institute of Digital Archaeology 3D-printed Palmyra Arch of Triumph featured at the 2017 World Government Summit in Dubai, seen here in Gulf Today. Interview with Dr. Mechtild Rössler, Director of Heritage Division & Director of the World Heritage Centre, on her recent visit to assess the damage to Palmyra, and with others working on the ancient site, in Travel and Leisure. The Aleppo Project featured the damage to Al-Adiliyyah Mosque, Aleppo here. Tina Greenfield speaks about looting and ISIS for UM Today News, although some have questioned the figures she cites. Italy’s work to restore the Palmyrene busts, covered in our last newsletter, has been featured in a number of articles, such as this piece in the Telegraph, in Al-Monitor and here. The Straits Times reports on the new online Getty Exhibition about Palmyra as does The New York Times and the VOA. WION reports on the destruction at Palmyra from one of the teams that worked there.